Okay, we have to admit, we sort of reverse-engineered this one. We were moseying around our local beer vendor when we came across—no kidding—a carrot cake beer. What would you do if you were us? You’d buy it. And then you’d find a game to pair with it, because that’s why we drink (mostly). 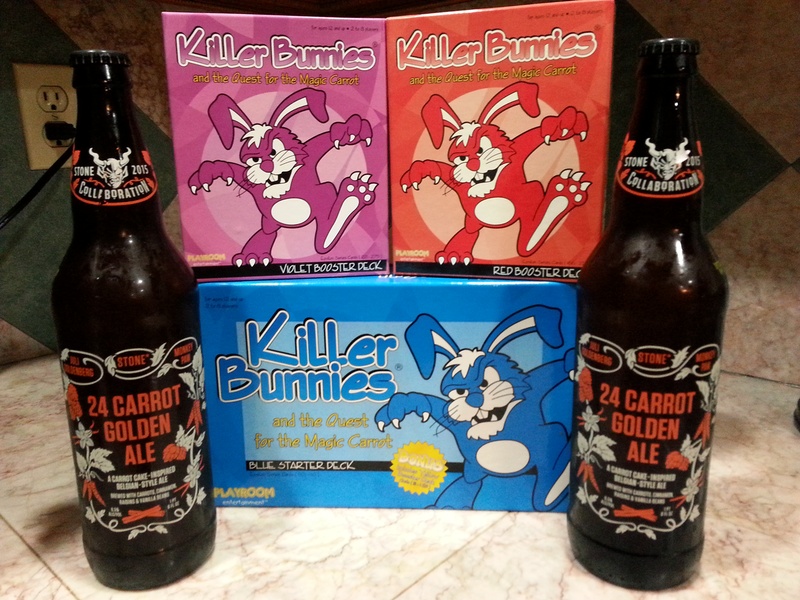 So for this week’s Game & Beer Pairing, we sipped Stone Brewing Co.’s 24 Carrot Golden Ale, a “carrot cake inspired” Belgian brew, while playing Killer Bunnies and the Quest for the Magic Carrot. Killer Bunnies is a turn-based card game with a two-fold win condition: you need to have at least one bunny alive at the end of the game, and you need to have the Magic Carrot, which is one of twenty carrots that you can choose from… but you won’t know which it is until the very end of the game. This makes it part strategy (keep a bunny alive while killing other players’ bunnies), part luck (have the Magic Carrot), and part probability (the more carrots you have, the higher the chance one of yours will be the Magic Carrot). It’s not player elimination—sort of. 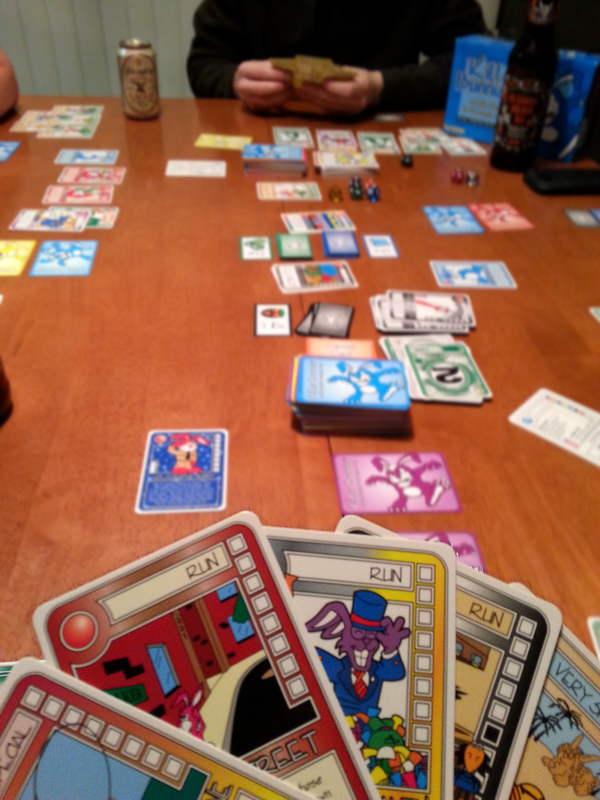 No one is eliminated until the last carrot is taken; then, if you have no live bunnies, you can’t win, so you must give your carrots to the player with the most money (called Dollas) and at least one live bunny. There are a lot of expansions for Killer Bunnies. We played with the base set and three expansions—yellow, red, and violet—though in all we have ten expansions, and we’re pretty sure there are even more available. 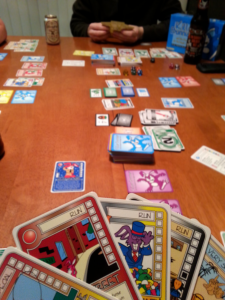 First, the bad news: Killer Bunnies is very much a screw-your-friends type of game. And now the good news: It is a lot of fun! 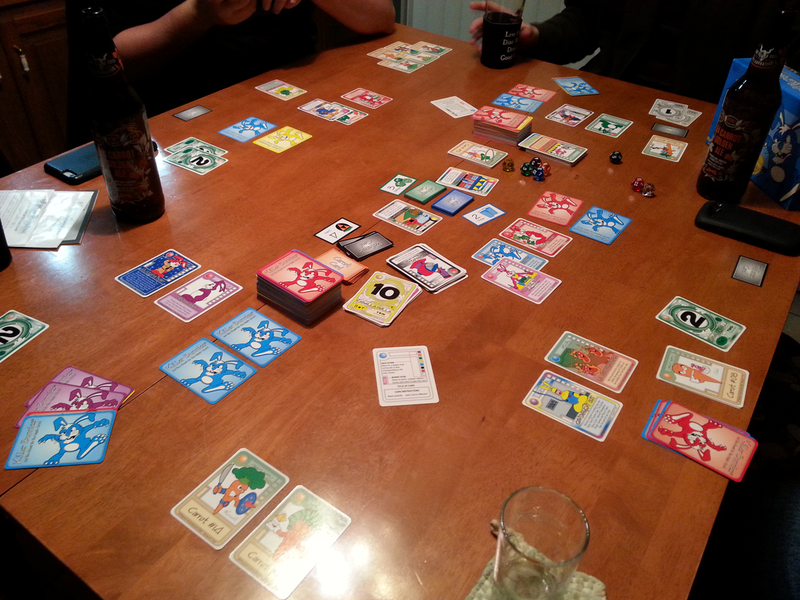 Throughout the game you have a five-card hand, and two more cards face-down at any given time. With the two cards face-down, you’re trying to plan two turns ahead (i.e. programming), while still being able to play some cards from your hand as reactive or interrupt cards. The fact that it’s kind of silly and the art is so simplistic really works to counteract any animosity you might garner for the “take-that” aspects… or at least it did in our group. Rather than shouting or cursing because someone killed our bunny, we laughed it off—especially when Mike’s Lumbering Bunny was killed by “enthusiastically” rafting off a cliff. 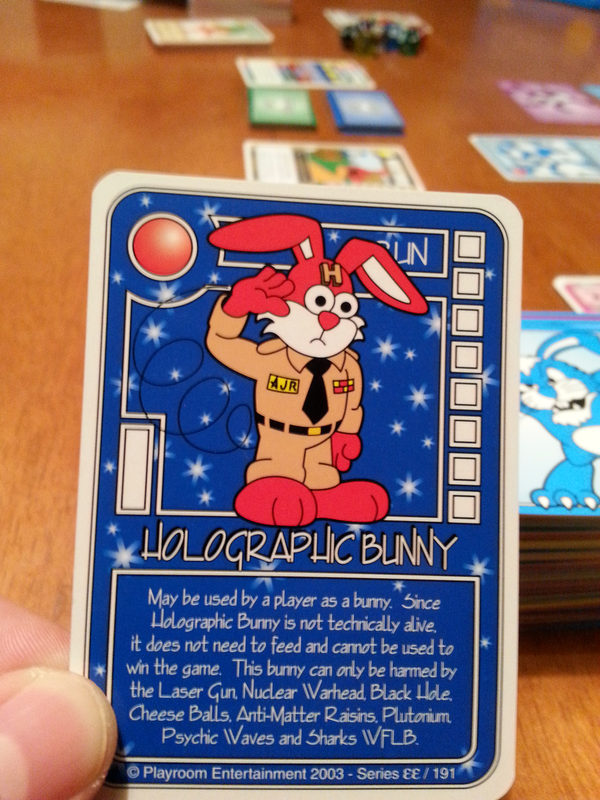 Not only will players try to kill your bunnies, but the deck will too; random Terrible Misfortune cards are littered throughout, and upon drawing one, it immediately murders one of your hapless rodents. 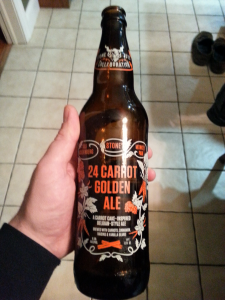 More carrot than cake, this beer was still a fine brew! Anthony had a Holographic Bunny out that couldn’t be killed—but it could be stolen, as he found out when Mike took it from him. Late in the game, Alfred had three bunnies out, Mike had five, and in one fell swoop—thanks to the Black Hole weapon—their bunny armies were reduced to one each. Our paired beer, Stone’s 24 Carrot Golden Ale was more carrot than carrot cake, but was still tasty. It’s a Belgian ale on the heavier side with a bit of sweetness. There was also a hint of cinnamon in there and a mildly minty (?) aftertaste. Stone has a special place in our hearts for making good beers that are high in ABV, and though this one didn’t disappoint, it wasn’t quite as “cakey” as we’d hoped. It still made for a good confederate in our bunny-killing quest. Look at all the pretty colors!! By the end of the game, Tom had no bunnies, so he had to give all his carrots to Alfred, who had amassed a whopping eleven carrots (out of twenty). Mike had five carrots, and Anthony had four. Ultimately Alfred won—that’s the probability/luck aspect. There was still a 45% chance that one of his eleven would not have been the Magic Carrot. We’re all looking forward to playing this one again; it’s highly customizable, so next time we’ll likely add in some other expansions and tailor the deck to fit our group’s (usually) sunny disposition. Do you have a favorite “confectionary” beer? Which “take that” games do you like? Made in California by Stone Brewing Co.